As a health warning, most of this post was written sitting in a Euston station café after I found out that my train ticket to Birmingham New Street was for off peak travel only. That left me with nearly three hours (!) to spare, so I have probably gone overboard here. I was in London because I had a meeting with Michael Wolff. I have blogged about him before (here, here and here) after his visit to Birmingham as part of the Plus International Design Festival. The interview I did with him also provoked quite a big reaction from the city’s great and good. The meeting was more of a chat over lunch than anything formal (I am on holiday after all!). We talked about the process of branding businesses and about how the process might apply to a city. He had some interesting points to make. One was about the importance of understanding what you want your city to be about, before you start reflecting that through design. It’s an interesting exercise and I didn’t have an immediate answer. However, I think it that says a lot in itself. Some people might say you can’t simplify a city down to just a few key features but, in fact, we do it all the time. Manchester isn’t just about its football and its music, but there is no denying that it has benefited from those associations and, I bet, most Manchester residents are pretty proud of that. So, being stranded in Euston station for two-and-a-half hours gave me ample opportunity to mull it over! If Birmingham was a person, what would they be about? I got rather carried away and it ended up quite detailed covering home life, leisure, family, work, education and more! I imagine a lot of people will disagree with what I’ve written. I hope they do. I’m more than aware this image says as much about me as it does about Birmingham. I only hope it is not as soaked in middle class stereotypes as I fear it may be. However, the point still stands: the more people that undertake the exercise there is more of a likelihood that common themes will emerge. This could then be used to develop perhaps five key areas that could be developed to help define the city, Michael suggests. Maybe it is committing to developing the best care homes in the UK, or perhaps there is something else that Birmingham is good at that can be built upon, boosted and made part of the city’s image. Birmingham is a warm, welcoming and outgoing person. He has lived his life in the city of his birth and has a strong identity with its traditions and heritage. He is proud of what it has achieved and likes to be associated with the great innovators of the past. But, along with this sense of place, he has a strong cultural connection to one or more other countries/cultures. His parents/grandparents/ great grandparents arrived in this city and made their home here. He likes to share this cultural background with his friends and to hear about their cultures and traditions. As a result, his musical, artistic and culinary tastes are eclectic and diverse. His home is a popular destination for parties and events, as he has the knack of making everyone feel at home, no matter who they are and where they come from. He has a great sense of humour and can laugh at himself. That doesn’t mean, however, that he isn’t proud of who he is. His house is not showy, pretentious or egocentric. It is comfortable, clean, welcoming but also well designed and stylish. Its innovative and environmental features often impress guests. But, despite this, he is, generally, modest and is not a man that indulges in crude status symbols. He is no yuppy. Making people feel comfortable is more important than showing them how successful he is. That is not to say, however, that he is unsuccessful. His creativity and education combine to make him refreshing and inspiring in his work. He is very good at what he does and embraces new developments in his industry as opportunities, not threats. He is often at the forefront of these developments. When it comes to clothes and fashion, he is confident and innovative enough to have developed his own sense of style. But he remains constantly open to, surprised and delighted by new ideas. His car looks good, but it is more likely to have been chosen because of its clever use of design. This is a trait that he is very proud of. After all, doesn’t he deserve something that is more than just adequate? He loves playing and watching sport and is a great supporter of his local teams, especially football and cricket. Family is important to him. He recognises the sacrifices made by generations before him and wants to provide them the best possible care for them as they get older. For his children, he wants them to have an education that opens doors and provides opportunities. Although he’d love them to stay in the city to develop their careers, he is happy that if they have to move on, they will be proud to say where they have come from. He is also passionate about instilling an attitude of creativity and invention – it’s ok to fail if it is part of how you improve and develop. 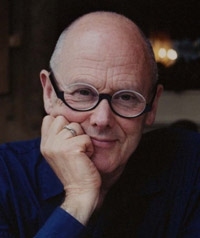 Michael Wolff, co-founder of design and brand agency Wolff Olins will be speaking at the PLUS International Design Festival at the Wild Building in Birmingham. The event is free, but if you can’t make it and have a burning question, let me know! Mr Wolff is considered one of the creators of brand identity and has worked with a number of high-profile companies to help shape their public image. Although he left Wolff Olins in 1983, he has also shown strong public support for the infamous Olympic 2012 logo, which the company reportedly created at a cost of £400,000. At the moment I’m planning to ask him about the process of creating trust through a brand identity. He was responsible for the so-called “greening” of BP and the aligning of its brand with renewable energy production. Also, how easy is it to rebuild trust in a brand after a crisis (such as Northern Rock, perhaps)? Of course, they’ll be the inevitable question about the 2012 logo too, I’m sure.